Though pictured on the back of the Star Wars 20 and 21 back cards with a Stormtrooper blaster, the figure was packed with a Han Solo Blaster. Comments: Craziest Star Wars action figure fact: The vintage Greedo, in his snazzy green jumpsuit and space boots, may not be the most accurate of all the versions that have been released to date, but he is (technically speaking) the only one of them made that didn?t even consider shooting first? Major Variations: Though all vintage figures have minor variations, the Greedo figure has only one major variations. What is commonly referred to as the Tri-logo version, available in many parts of Europe, was molded in a richer green plastic. This figure, though hard to spot with the untrained eye, can easily be picked out by it's lack of COO* stamp. 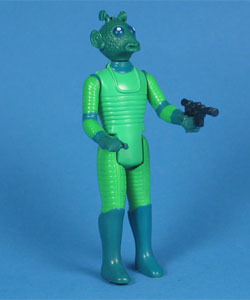 There is one documented example of a Greedo with blue spray opts, as opposed to the regular aqua green, but it is too early in this variation's discovery to state its scarcity. 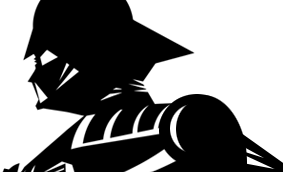 *COO is the commonly used term for 'Country Of Origin', which refers to the stamp usually spotted on a figure's leg that states which country it was manufactured in.